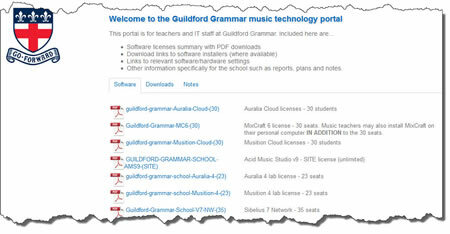 The Music EDnet music technology portal is an exclusive service designed to help teachers and IT staff to keep track of their music technology including software licenses, software downloads, audio and MIDI settings and notes. It also allows for the management and ongoing planning of music technology beyond ICT, such as PA and live sound systems, amplification equipment, electronic instruments, audio and video recording equipment and more ... all specific to each school. Technology planning notes are added as they are developed and updated. This includes recommendations developed from Technology Reviews and ongoing reviews from time to time. Access to each school's portal requires login by authorised teachers and IT staff from the school. Contact Music EDnet for more details.